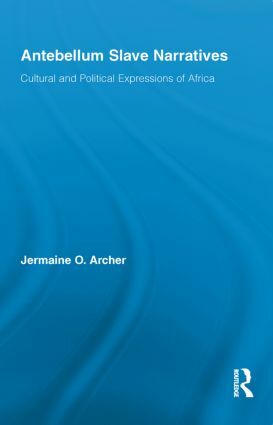 Though America experienced an increase in a native-born population and an emerging African-American identity throughout the nineteenth century, African culture did not necessarily dissipate with each passing decade. Archer examines the slave narratives of four key members of the abolitionist movement—Frederick Douglass, William Wells Brown, Harriet Tubman and Harriet Jacobs—revealing how these highly visible proponents of the antislavery cause were able to creatively engage and at times overcome the cultural biases of their listening and reading audiences. When engaged in public sphere discourses, these individuals were not, as some scholars have suggested, inclined to accept unconditionally stereotypical constructions of their own identities. Rather they were quite skillful in negotiating between their affinity with antislavery Christianity and their own intimate involvement with slave circle dance and improvisational song, burial rites, conjuration, divination, folk medicinal practices, African dialects and African inspired festivals. The authors emerge as more complex figures than scholars have imagined. Their political views, though sometimes moderate, often reflected a strong desire to strike a fierce blow at the core of the slavocracy.